We invite you to come with us on a journey of tapas discovery, limited only by how long you can sit here reading before your mouth starts salivating and you simply have to get up and try a tapas recipe! Here you will discover everything you ever wanted to know about the small plate with the big flavour . . . the tapas. Plus lots of other Spanish facts and fancies that you may not have realised you wanted to know! Our aim is simple: we hope that if you are interested in cooking, preparing or serving the enormously varied tapas recipes of Spain, then you will come back to visit us time and time again. There is so much of interest to learn about the fascinating origins and history of tapas. I am still learning something new every time I go out to a local bar, or when I chat to the proprietor at the Jamon y Queso (ham and cheese) shop. Oh, did I not mention that we are lucky enough to live in Andalucia, southern Spain? Such is the diversity of tapas that in bars all over Spain and the world you can order virtually anything that takes your fancy. From an exotically-flavoured, spicy Moorish dish to a simple bowl of olives. The choice is entirely yours. But oh, my friend, what a choice tapas are! 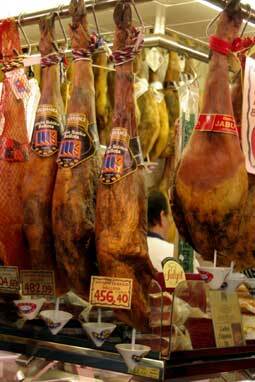 How about a plate of succulent, wafer-thin slices of serrano ham or jamon iberico? If you havent tried this yet then you have missed out on one of lifes gastronomic pleasures. Tapas truly are heaven on a small plate! A glass of Manzanilla sherry with some salty and nutty Manchego cheese is a very popular tapas with the Spanish locals. It doesnt come much simpler and it takes some serious beating. All these wonderful flavours and we havent even started cooking yet! You can keep it simple or you can make it as complicated as you like. But whichever way you prefer it, tapas is best served with an early evening drink among friends and lively company. You will not, I promise you, find a more pleasurable and flavour-filled experience than tapas anywhere in the world. Wherever you live, these 'little tapas dishes' will give you a tasty little mouthful of Spain. So sit back, take your time and enjoy your tapas to the full. There is no better way to sample the real essence of Spanish life and culture. It is said that the first tapa was simply a hunk of bread which was placed over the glass to keep the flies out. Hence the word tapas was born. Tapa literally meaning cover or lid. In the beginning somewhere must have been the olive - plain and simple, on its own. What better accompaniment to a glass of dry fino sherry than tapas? Or perhaps some almonds . . . fried in olive oil, sprinkled with salt and served while theyre still hot? 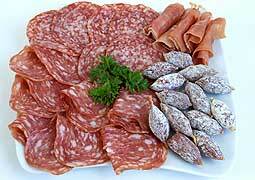 These are the original tapas, the simplest of foods, requiring little or no preparation. As the tradition developed, tapas became more of an elaborate event, with each region developing their own specialities. They were still 'little tapas dishes' but the personalities of thousands of bar owners all over Spain has stamped them with the identities that they have today. Spain also has climate extremes. Regions that are cold and wet, regions that are hot and dry, and just about everything in between. It has a huge coastline, facing both the Atlantic ocean and the Mediterranean sea. Spain's fishing industry is one of the most active, and pro-active, in Europe. Hardly surprising then, that the cuisine of its coastal regions is very heavily based on fish and seafood. Age-old regional methods and local ingredients have been influenced throughout the country's long history by the incorporation of many ingredients and influences from different cultures and countries. The east coast was invaded by the Romans, who introduced the olive and irrigation methods. 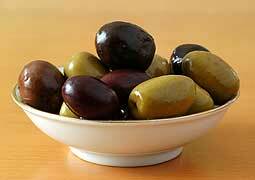 The invasion of the Moors also brought olives to the south, as well as almonds, citrus fruits and fragrant spices. The influences of their seven hundred year occupation remain today, especially in Andalucia. The discovery of the New World brought with it the introduction of tomatoes, sweet peppers (capiscums), chilli peppers, beans and potatoes. These were readily accepted and easily grown in Spain's ideal micro-climates. Spanish food, and especially tapas, is based on simple methods and the imaginative use of seasonal vegetables and local ingredients. Tapas is essentially hearty and unpretentious. Ingredients are fresh, flavours are robust and recipes are easy. Preparation and presentation is generally pretty straight forward. You'll find no 'pan-fried' this and 'sun-blushed' that here, my friend. The success of a tapas dish is purely down to one basic criteria: whether or not it tastes good. Which, I hope you agree, is how it should be. This article about tapas recipes is taken from the introduction to the web site of Proper-Spanish-Tapas.com and written by Steve who has created a fascinating web site looking at this famous facet of Spanish cuisine.